Please click the applicable question. For information on how to operate Minato, please check the manual after logging in. A.JF Japanese e-Learning Minato is a Japanese language learning platform provided by the Japan Foundation. For further details please see here. Q2. What does the site contain? A.As a place of learning it has Japanese courses, and as a place for meeting other like-minded people it has various communities. In addition, it makes available a web site and various apps developed by JF for the studying of Japanese. For further details please see here. Q3. What are the recommended system requirements for Minato? A.Please refer to the 'For First Time Users' - 'Course Environment', section of the User Guide (here). Q4. The email I received contains corrupted text. A.If the email you received from Minato contains corrupted text, please check the points below. If the name you registered contains old or unusual fonts etc., the text may appear corrupted. It's possible that the email software you're using is not applying the correct font encoding. Minato sends emails using the 'Unicode（UTF-8）' encoding format. Please try resetting the email you received to the 'Unicode（UTF-8）' encoding. If after performing the above operations the problems is not resolved, please contact us here. Q5. I don't know how to do the user registration. A.Please refer to the 'User Registration' - 'User Registration Procedure', section of the User Guide (here). Q6. Does it cost money to user register? A.No, user registration is free of charge. Q7. What sort of things can I do when I register as a user? A.You can participate in, and make use of the Japanese courses and communities that Minato provides. For details, please refer to the 'My Page' of the User Guide (here). Q8. What will the information I register be used for? A.We will use that information as a reference to allow us to provide more useful content, and for advising of new Japanese language courses, etc. With regard to your name, this will be used as the recipient name on completion/attendance certificates. For further details, please refer to the Terms of Service (here). Q9. Will the information I register also be released to any other people? A.There is Non-Public information, and information which can be set as Public/Non-Public. For details please see the manual after logging in. Q10. I completed the user registration using a mistaken email address. A.First, please check the points below, and then redo the user registration from here using the correct email address. Mistakenly entered using commas (,) or dots/full-stops? Any half-width spaces entered within or after the email address? Have the 'co.jp' or 'ne.jp' etc., been mistakenly entered? Q11. I did the user registration but no email has arrived. A.Please check the points below. Are there any errors in the email address you registered? If you completed the user registration but no email has arrived from Minato, it's possible that the email address you registered is incorrect. First, please check the points below, and then redo the user registration from here using the correct email address. If your email inbox etc., has no available space it's possible that no new emails can be received. Please delete any unwanted emails in order to increase the available mailbox space. Is your mobile phone/smartphone set to refuse incoming messages? If your mobile phone/smartphone etc., is set to refuse incoming messages, or has some type of anti-fraud settings, it's possible that new messages are being refused. By changing your settings to grant permission to incoming messages from the Minato domain or email address, you should be able to receive emails correctly. Please refer to the instructions for your particular device on how to do this. ※ The domain name for emails sent from 'Minato' is '@minato-jf.jp'. Has it been assigned to the Spam folder? It's possible that the email sent by Minato has been automatically assigned to your Spam or Trash email folder by the mail filtering functions of your Web email (Gmail, Yahoo! Mail, AOL Mail, etc. ), or by any email or virus software functions that you may have. Therefore, please check that it is not in your Spam or Trash folders etc. By adding the Minato domain and email address to your 'safe list' or 'approved list' or your address book etc., you should be certain to receive any messages. ※ The domain name for emails sent from Minato is '@minato-jf.jp'. Are messages being blocked by your providers email filtering service? It's possible that the email filtering service of the provider you are using is blocking emails from Minato at the server, and these emails are not even reaching your Spam mailboxes etc. By using the settings of your provider to mark email from Minato as approved, or required etc., you should be able to receive emails correctly. Please refer to the instructions for your particular provider on how to do this. When completing a user registration with an AOL email address, it's possible that due to AOL policies for receiving email you may not receive emails sent from Minato. We recommend that you use a different email address than AOL when completing the user registration. If, after checking all the above the email still does not arrive, please make an inquiry from here. Q12. Can I change the email address I registered? A.Yes, you can. For details, please refer to the 'My Page' - 'Confirming/Changing Registration Details', section of the User Guide (here). Q13. I'd like to change the user information I registered. A.For details, please refer to the 'My Page' - 'Confirming/Changing Registration Details', section of the User Guide (here). Q14. Is it necessary to make a setting for Summertime/Daylight Savings time? A.No, that is not necessary. It will be set automatically based on the time zone in your profile. A.Please check the points below, and try logging in again. Please access this by copying the whole URL below and pasting it into your browser's address field. If it says "Your User ID or Password is incorrect"
Please check the points below and re-enter your User ID and password. Is the User ID entered using 6 alphanumeric (half-width) characters? Have any of the following been mistakenly entered - the number zero '0' and the letter 'O'; the letter 'I' and the letter 'l' and the number '1' etc? If you have entered any data using copy & paste, have you copied any extra blank spaces? Are you entering an old (unchanged) password? Confirming your User ID and reissuing your password can be done from here. First, please close all browser windows and re-launch the browser. Then please access the login screen and attempt to login. If you are still unable to login after that, please try the following browser settings (refer to your browser's support page etc., for exact method). Please check if Cookies are enabled or not. If they are not, please change the setting to make them enabled. Please delete your browser's cache. If you are using a workplace or public facility's LAN network or similar, there may be a proxy server, firewall, or filtering software etc., which puts limitations on the web sites that can be viewed. Please check the points below, and then seek advice from the facility's IT administrator. When did you first have trouble logging in? Can you access other web sites? Can you login from other computers? Can you login from your home or other locations/environments? Further, even if none of these problems exist, there may be times when performance problems arise due to network connections being congested. If, after checking the above you still cannot login, please make an inquiry from here. Q16. The account has been locked. A.When an account has been locked, it will become unlocked momentarily. Please wait a short while and then login again. ＊If you attempt to login while the account is locked, an error message will be displayed, but the account lock start time will not be reset. Q17. I forgot my User ID/password. A.Confirming your User ID and reissuing your password can be done from here. Q18. I want to change my password. Q19. I want to suspend membership (suspend account) /reopen my Minato account. A.Please refer to the 'Suspension/Account Deletion' - 'Suspension', section of the User Guide (here). Q20. I want to delete (cancel membership) my Minato account. A.Please refer to the 'Suspension/Account Deletion' - 'Account Deletion', section of the User Guide (here). Q21. I deleted my account (cancelled membership). Can I reinstate it? A.No, you can't. Please complete the user registration once again. Q22. Are you able to resend the notification of final registration email? A.No, we can't. Please wait until 24 hours have passed since your previous new registration, and then complete the new user registration once again. Q23. I don't understand how to login. A.Please refer to the 'User Registration' - 'Login/Logout Procedure', section of the User Guide (here). Q24. I don't understand how to logout. Q25. What's the difference between a Community and a Group? A.A Community is a place where all the Minato users can meet and interact. A Group is a community within each Japanese course that only those who are attending, or have attended, that course can use/view. Q26. How many communities can I join? A.You may join any number of communities. Q27. How do I search for communities? A.Please refer to the 'Communities' - 'Joining Communities', section of the User Guide (here). Q28. Is it possible to delete communities and noticeboards? Q29. Can I change or delete my posts on the noticeboards? A.You can delete your own posts, but you cannot change them. For details please see the manual after logging in. Q30. What should I do if I find an inappropriate post? A.Please report it. For information on how to report, please see the manual after logging in. Q31. Is it possible to make the communities non-public? Q32. How do I send a message? A.For details, please see the manual after logging in. Q33. How do I reply to a message? Q34. Can I refuse a message from specific people? A.Yes, you can. For details, please see the manual after logging in. Q35. Can I send video and images with messages? A.You can send images, but you can't send video. For details, please see the manual after logging in. Q36. I got a message from someone I don't know saying "I will teach you Japanese". A.Minato does not send this type of notification or message. You can either ignore this message, or if it comes repeatedly you are able to block specific users. For details, please see the manual after logging in. Q37. What kind of courses are there? A.You can find this out at the Home page (here). Q38. What levels are there? A.There are 6 levels of courses, A1, A2, B1, B2, C1, C2, based on the JF Standard for Japanese Language Education (JFS), and released sequentially. For details, please see the Home page (here). Q39. What is the self-study course/tutor support course? A.The self-study course is an online course where the assessment/evaluation is carried out automatically. The tutor support course is one where, in addition to the online study, there is also assignment marking, Live Lessons, and various evaluation methods conducted by a tutor. For details, please see the manual after logging in. Q40. I'd like to find out about the 'Marugoto Course'. A.This can be checked on the home page (here). Q41. Where is the standard for the displayed time? A.On the Home page (here) and for the 'Course Term' and 'Application Period' within the Course Outline of the Japanese courses, the time displayed is Japanese time. After logging in, on each 'My Page' the various time periods are displayed using the time zone registered in your profile. Q42. What kind of people are the Minato instructors? A.Japanese language instructors from within Japan and overseas, affiliated with The Japan Foundation. Q43. Is it possible to request a private lesson with the Minato instructors? Q44. What is the Course Term? A.The maximum interval between starting and finishing a course. If study is not completed within this time, the term will end and study will not be able to proceed beyond that point (study materials can be viewed). Q45. What are 'Complete By Date', 'Test By Date', 'Submit By Date', 'View By Date', 'Respond By Date' ? A.The time limit by which you must complete the study of, or the viewing of, or the answer to test questions for, the separate study materials within each course. These time limits may be set for different times than the course term, so please be sure to always confirm this in advance. Q46. How long can I view the study materials? A.Apart from some exceptions, you can always continue to see the study materials for courses you have finished attending/completed (not including Term Ended). However, they will only be for viewing purposes, and therefore you will not be able to answer any test or quiz questions. Q47. What is a Group? A.This refers to the community that is made with each Japanese course. There are some courses without a group. For details, please see the manual after logging in. Q48. I'm not able to make a post to a group. A.Approximately 2 weeks after a course terms finishes, groups become view-only. Once a group becomes view-only you are no longer able to make posts or delete posts. For details, please see the manual after logging in. Q49. Are the group noticeboards able to be deleted? Q50. What should I do if I find an inappropriate post? Q51. Please tell me how to enroll. A.Please refer to the 'Japanese Courses' - 'Study Process', section of the User Guide (here). Q52. How much does it cost? A.There are free courses and also paid courses. Please check the course outline for each separate course. Q53. When is the deadline for enrolling? A.The application period for enrollment differs from course to course. Please check the Home page (here). Q54. When will I know the result of the selection for a course I enrolled in? A.The day on which notification is sent regarding the results of the selection varies depending on the course. Please check the outline for each course. Q55. Can I cancel an enrollment? A.With regard to the free courses, and limited to only the tutor-support courses, you are able to cancel provided it is before the course has started. With regard to the paid courses, please check the course outline for each separate course. Q56. The information for a course I enrolled in does not display on 'My Page'. A.Please check again to see whether or not the 'Course Registration' button in the Course Outline has changed to 'Cancel Course'. In the case of courses awaiting results of a selection, information regarding that particular course will be deleted from 'My Page' at the same time as an Unsuccessful Candidate notification is sent. Q57. Is it possible to re-apply for a course after cancelling an enrollment? A.It's possible if still within the application period for enrollment. Q58. Is it possible to register for 2 or more courses at the same time? A.Yes, that's possible. However, regarding the 'Marugoto Course', if you are currently attending a tutor support course, or if you have previously finished attending/completed one, you are not able to enrol for a self-study course of the same level. Q59. What level of Japanese ability is required in order to enroll? A.The level of Japanese ability required is different from course to course. Please check the outline for each course. Q60. Are there conditions for enrolling? A.The conditions for enrolling are different from course to course. Please check the outline for each course. Q61. Is it possible to join a course that is already underway? A.With regard to self-study courses, you may enroll at any time that suits you in order to begin studying when you would like. For tutor support courses, you cannot join midway through the course. Q62. Is it possible to attend 2 or more courses at the same time? A.Yes, that's possible. However, regarding the 'Marugoto Course', you cannot attend two courses of the same level at the same time. *While attending a 'Marugoto Self-Study Course', if you are selected for a 'Marugoto Tutor Support Course' of the same level, you will be transferred to the tutor support course. Q63. Can I quit midway through a course? A.No, you cannot. In such a case you will need to wait until the end of the course term. However, with regard to the paid courses, please check the course outline for each separate course. Q64. Can I attend courses using a computer anywhere - such as home, school, work, etc.? Q65. Can I attend courses using a smartphone or tablet? A.It varies with the course. For details, please see the outline for each course. In addition, please check the 'For First Time Users' - 'Course Environment', section of the User Guide (here). Q66. What is the ☆ symbol on the 'Unreleased' for study materials? A.This refers to study materials where the release date for that study material has already arrived, but the prerequisite study materials that must be finished in advance have not yet been completed. For details, please see the manual after logging in. Q67. I'm not able to attend the Live Lesson - what should I do? Are alternate lesson times available? A.Because Live Lessons are conducted on a specific date & time (together with other students) there are no alternate lesson times available. If you are not able to attend a scheduled Live Lesson please advise the instructor in advance. Q68. What is a 'badge'? A.When a course is completed a course badge is awarded. Details of course badges that have been obtained are on the profile screen and completion certificates. For details, please see the manual after logging in. Q69. Am I able to receive completion certificates/attendance certificates? A.Yes, you are. For details, please see the manual after logging in. Q70. What's the difference between a completion certificate and an attendance certificate? A.Completion certificates are given to those who have fulfilled all the conditions set out in the requirements for completion. Attendance certificates are given to those who have completed all the course materials set out in the requirements for completion, and for whom some portion of the conditions remain unfulfilled. For further details, please see the course outline. Q71. Is the Completion certificate an official document certifying Japanese language ability? A.No. The Minato Completion certificate is for the purposes of certifying that a study course provided by Minato has been completed. It is not for certifying Japanese language ability. Q72. The course term has finished but the Completion certificate hasn't arrived. A.Please confirm that you have fulfilled all the conditions set out in the completion requirements, by checking the 'Completion Requirements' within the course outline, and the 'Study Record' on 'My Page'. Q73. Do I receive a report card? A.Yes. The 'Study Record' on 'My Page' acts as a report card. For details, please see the manual after logging in. Q74. The Completion Certificate/Attendance Certificate, Study Record are incorrect. A.We apologise for any inconvenience. Please contact us via the inquiry page (here). Q75. I can't see the study materials. Either contact us via the inquiries section (here), or check with the course instructor. ※ For information regarding course instructors, please refer to the 'Instructor Profile' on the 'Course Outline' page. It may be because what's viewable can differ from course to course depending on the device/system you are using. 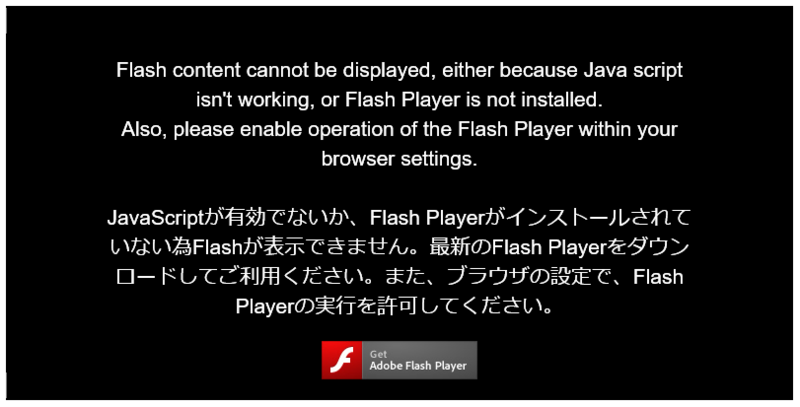 If the following screen appears, then this course requires the Adobe Flash Player plug-in to be installed. You can download the "Adobe Flash Player"plug-in free from the following site. If after checking the above the problem is still not resolved, please make an inquiry from here. Q76. I can't submit an assignment. A.Please check the following points. Please check the file size that can be attached and the file formats that can be uploaded. Please check the volume level of the device - computer, mobile phone, smartphone etc., - that you are using. Please check that the speakers are properly connected. When using earphones or a headset there will be no sound from the speakers. Please check the speaker sound after removing the earphones or headset from your computer, tablet, smartphone, etc. Also, sound may not come from the speakers if the input/output holes are clogged or blocked in some way, so please also check for this. (Please consult the support page etc., regarding your earphones, headset). If you are using a browser other than those recommended by the Minato system requirements, it's possible for there to be problems with the display. Please check the display using a browser in the recommended system requirements. Also, please check whether or not videos from other websites play on the computer, tablet, smartphone etc., that you are using. It's possible that the speed of your internet connect is insufficient for playing videos, or the connection speed is unstable. The connection speed recommended by Minato is 10Mbps (10,000Kbps). Please double-check that your connection is achieving these speeds. If you are using a wireless LAN connection, please try testing using a wired LAN connection. Q79. I can't open a PDF file. When viewing a PDF file from a tablet or smartphone, it's necessary to have the application for that purpose installed. Please install the 'Adobe Acrobat Reader', and use that application to view the file after downloading. Q80. I can't open the Completion Certificate/Attendance Certificate, Study Record. A.When opening the Completion Certificate/Attendance Certificate, Study Record from a tablet or smartphone, it's necessary to have the application for PDF files installed. Please install the 'Adobe Acrobat Reader', and use that application to view the file after downloading. Q81. How do I attend a Live Lesson? A.For information regarding courses with a Live Lesson, there is a detailed explanation in the 'Live Lesson' section of the course outline. For further details please see the manual after logging in. Q82. I haven't received a reply to my inquiry. A.If several days have passed and you haven't received a reply, please once again make an inquiry from here. We apologise for any inconvenience. Note - it's possible that the email reply sent by Minato has been automatically assigned to your Spam or Trash email folder. For details, please see here. Q83. Is it possible to make inquiries via the phone? A.We apologise for any inconvenience, but we do not provide support via the phone. Please make an inquiry from here. Q84. I would like to add a link in order to introduce Minato to others, but is permission etc., required to do so? A.You may freely link to Minato. There is no application process etc., required. Also, you may link to any of the pages. Should it be necessary to use a banner image of some sort as the link, please feel free to use one of the images below.